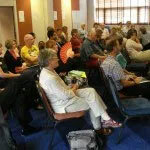 On June 24th 2010 around 60 people from England, Wales, Scotland, Northern Ireland and the USA came together at the Nottingham Gateway Hotel for the 2nd Annual Conference of APSE ( Association of Pastoral Supervisors & Educators). Between them they represented the worlds of parish and local ministries, counselling, training, ministerial development, spiritual direction, healthcare chaplaincy, theological education, higher education chaplaincy, writing and research. Roman Catholics, Methodists, Presbyterians, Anglicans, Baptists, URC and Orthodox, New Agers and Jews met to explore the conference theme ‘Supervising with Spirit.’ After a short act of reflection, Robin Shohet, co-author of ‘Supervision in the Helping Professions,’ and editor of ‘Passionate Supervision’ opened the day with a provocative address which invited us (with Hafiz) to ‘pull the chair out from under our minds’. ABC of Pastoral Supervision for those new to supervision and supervising led by Debbie Ford. The Journey from Counselling to Pastoral Supervision led by Jessica Rose. Supervising the reluctant and unconvinced – working with experienced pastoral workers who are now expected to engage in Supervision led by Ruth Layzell & Mogs Bazeley. Widening Our Gaze: experiencing supervision as a reflective process led by Julia Barrett & Tony Nolan. Supervision through Creative Methods led by Jane Leach. Supervising the ‘then and there’ in the ‘here and now.’ led by our key speaker Robin Shohet. The participative character of the day continued into our Annual Business Meeting with the bulk of the time devoted to asking participants for suggestions which would forward the purpose of APSE. A lot of energy was expressed in favour of: – creating networks both regionally and according to work contexts – developing training programmes to prepare people to supervise as well as to acquire the necessary experience required for accreditation – revisiting the current Code of Practice to make it a more holistic Code of Good Practice – developing the existing website to include a discussion forum. The meeting concluded with the election of a new Executive Committee who will serve for one year until the AGM 2011.